Flanery Brothers Automotive is a story about one man’s creative genius working with motors and his dream to run his own business. Bernard (“Bum” – a childhood nickname that he preferred to his given name) Flanery was an intensely honest, generous and independent man who liked to think for himself. In 1957 he decided not to re-enlist in the Navy and to try his hand instead at running his own business. A self-taught mechanic, he opened a Mobil Service Station on the triangle of land where Hiawatha and 34th Avenues came together. From that day on, “service” was the operative word in describing his business. It was a tough start. Bum ran that first business alone, working 12-18 hour days, 7 days a week. He learned that it’s difficult to make a go of a new business, no matter how hard you work. The need to provide for a family that included 3 young children served as a powerful motivator for Bum. Despite the odds (80% or more of all new businesses fail) that first business stabilized and soon began to grow. The shop changed locations a couple of times over the next 25 years, always staying in this South Minneapolis neighborhood. Flanery’s moved to their current location in 1980. They were no longer selling gas. They focused on what Bum and his sons did best – diagnose engine problems and fix vehicles. And finally they were down to a 5-day work week. Sons Tim and Brian have worked in the shop since they were in high school. They are proud of the business established by their dad, and like him, preferred the independence of being their own boss. From their dad they learned how to establish loyal customers. That loyal customer base is what best describes Flanery Brothers Automotive today. 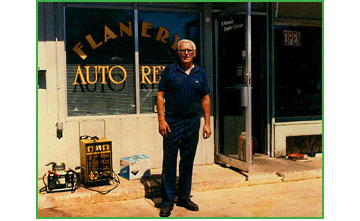 Customers may move out of the community, but they often continue to bring their cars in to Flanery’s – sometimes coming from long distances. Their customers trust them and the work they do. Customer trust is important to Flanery Brothers Automotive. Today, 50 years after Bum opened his first shop, Flanery’s is still very much a family business. Brothers Tim and Brian own the shop. Bum’s grandson Nick, an excellent mechanic, is following in the family tradition. The 4th mechanic, Jeff, joined them more than 10 years ago. His work ethic and talents are a good fit at Flanery’s. These guys are known for their expertise and honesty – in fact they have been recognized by the University of Minnesota Daily (the campus newspaper) as a “Best Place to Get Your Car Fixed”, and considered good citizens in the community. Flanery Brothers Automotive takes pride in maintaining an attractive and clean business site, and they are strong supporters of community programs and events.